2008: The Best Crown of Thorns Video Awards! Because you demanded it! 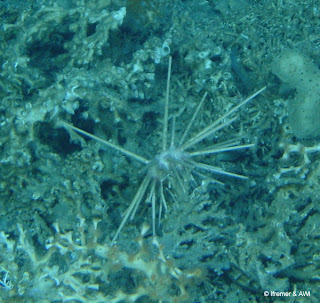 The Best (and so far..only) Crown of Thorns (aka COTS)- (Acanthaster planci) Videos that I have featured of 2008!! Let them inspire you as they have me! How many COTS videos come with a soundtrack and a long essay about how beautiful they are? 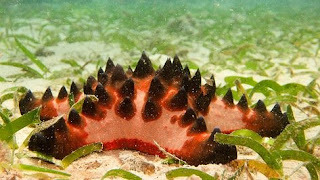 here's the giant Triton Charonia in a life and death struggle with the COTS! pt. 2: Classy vs. 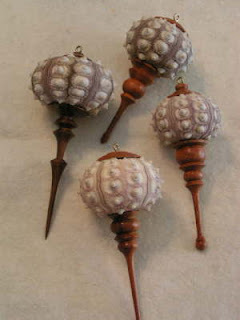 Tacky: Your Sea Urchin Xmas Edition! 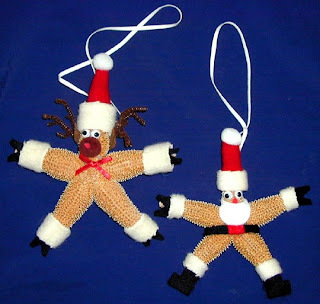 So...following Monday's "Hall of Shame" theme...here are some tacky sea urchin ornaments/gifts...BUT so that this isn't entirely negative..I've included a CLASSY echinoderm-oriented gift down at the bottom! BUT on the OTHER hand? What's a CLASSY Echinoderm gift item? 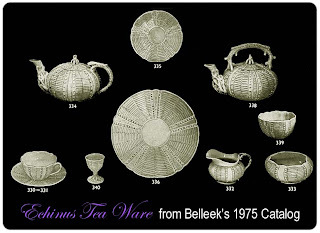 Sterling Silver Echinus Tea Ware set from the Belleek 1975 Catalog!! Hopefully to DISCOURAGE their use or at least to shame the people who make these things..because frankly dressing up dead corpses is kind of macabre AND tacky. Let us not remember that asteroid tests are actually more like MUMMIES (skin covers the surface). They are NOT shells. Living Animal: 4. 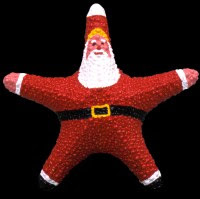 Asterias forbesi (Asteriidae) made into..Santa and his Reindeer..I guess? 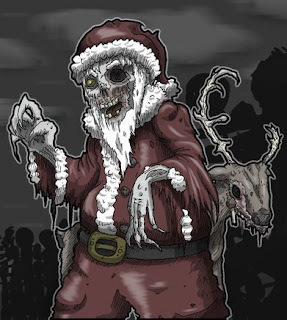 Dead Sant....maybe not...uh...I guess an homage to the Mele Kalikimaka song?? Living Animals: On Wed....Pt. 2-The Sea Urchin Hall of Shame! Video Wednesday! Starfish Making Snow..uh..Sand Stars! and this one is Astropecten from Mexico apparently. I would turn down the narrative....the burying starts at :40 sec. in.. 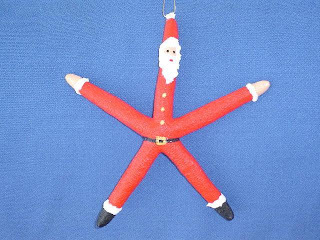 The Echinoblog Christmas Xmas Gift Book List!! So, the other day, Ron over at the Tide Chaser, asked me to recommend some field guides for him and the holidays were coming up..so I thought why not just make up a big list that might also make good gift books as well? 1. 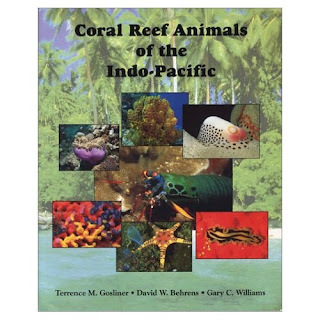 Coral Reef Animals of the Indo-Pacific. Coverage: The tropical Indo-Pacific from Hawaii to the east coast of Africa to northern Australia. Authors: Terry Gosliner, Gary Williams, and David Behrens. The authors are all published researchers who are also divers and photographers. Comments: I identified the asteroids and some of the ophiuroids in this book. Content is solid and comes with detailed distribution data and as much info on the biology of each species as possible. Coverage is widespread though and sometimes what you get is a little uneven but overall you are hard pressed to find a more solid treatment. This book is more then just a picture guide..its also got a number of valuable natural history nuggets, including an account of the predatory eunicid polychaete Eunice aka "The Bobbit Worm"....and if THAT doesn't get your attention, I don't know what will!! Available at: Amazon.com and runs for about 45.00 (USD) new. 2. 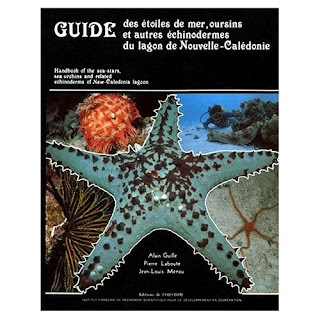 Guide to the Sea Stars, Urchins and other Echinoderms of New Caledonia. (en francais: Guide des etoiles de mer, oursins, et autres echinodermes du lagon de Nouvelle-Caledonie) Coverage: This book was part of the ORSTOM "Tropical Faunas" series of books and covers the shallow-water faunas observed in New Caledonia. 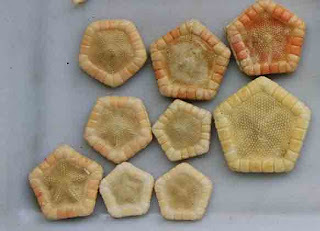 Although some of the taxa are limited to New Caledonia, many widely distributed Indo-Pacific echinoderm species are included. Has taxonomic keys as well as full color photographs in a nice hardcover, glossy paper format. Authors: The book is in French and includes chapters by several French echinoderm experts , including Alan Guille, Michel Jangoux, and several others. 3. 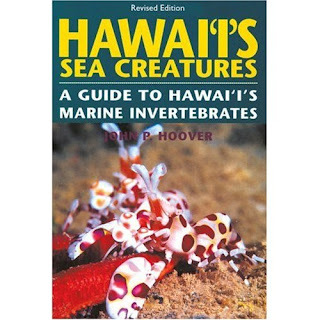 Hawai'i's Sea Creatures Coverage: A field guide to the marine invertebrate fauna in the Hawaiian islands region. 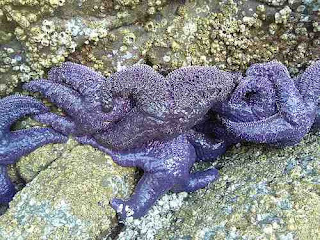 Includes species you would find from intertidal wading depth to the lower end of SCUBA. Very comprehensive! Author: John Hoover is a photographer and naturalist who resides in Hawaii and has studied and photographed the marine fauna there for MANY years. Although not a published echinoderm author, he is very thorough and his books are extremely well-done. Comments: I identified the asteroids and ophiuroids in this book and I was impressed at the coverage of taxa as well as the great lengths which were taken in order to ensure the taxonomic fidelity of the pictures in the book. So, I heartily endorse it for those who are interested, not only in the tropical shallow-water Hawaiian invertebrate fauana but also as a general guide to some of the more common Indo-Pacific species. Available at: Amazon.com for 24.45 (US Dollars) Additional details on the book are available at John Hoover's book website. An online addendum to this book can be found at Hoover's website for the book. Here. 4. 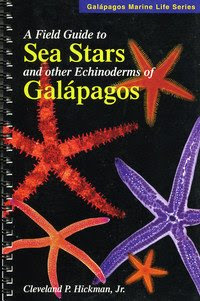 A Field Guide to Sea Stars and other Echinoderms of Galapagos. Coverage: Includes pictures of most of the asteroids and echinoderms from the shallow-water to lower SCUBA depths of the Galapagos. Many of the species occur more widely throughout the tropical East Pacific, so the guide has widespread use. Comments: This little spiral bound book is really a nice balance of pictures and general information for the interested field biologist/diver/photographer, including some relatively rare species. I identified the asteroids and reviewed much of the manuscript and so...its accurate and worthwhile. Available at: Amazon.com for 16.95. 5. 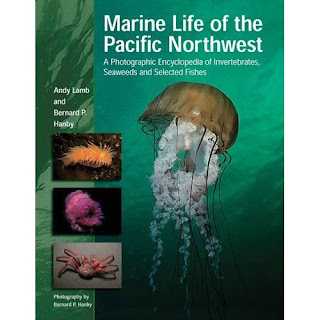 Marine Life of the Pacific Northwest. Coverage: This mighty volume is not so much a field guide, but the pictures are excellent and the format is easy to follow and content appears to be solid. Includes primarily invertebrates, but also fishes, seaweeds and some other stuff. Includes taxa from the northwestern section of the west coast of North America, which is quite diverse. Authors: Andy Lamb and Bernard Hanby. Don't know the authors but the IDs and information looks solid. Comments: A good accompaniment to the new edition of Light's Manual or any of the other classics to the Pacific Northwest literature. 6. Fossil Crinoids. Coverage: Okay, so this book is not a field guide, but there are few books on fossil echinoderms available to a wide audience out there and I think this is a good one. 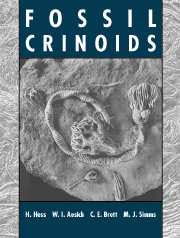 It includes chapters from different specialists and surveys crinoid environments acrosss time and looks at different fossil settings from around the world. From Paleozoic to the recent and from the classic midwest limestone deposits to some of the more unusual German crinoid lagerstatte (fossils of unusually excellent preservation). Authors: Hans Hess, Bill Ausich, Carlton Brett and Michael Simms. 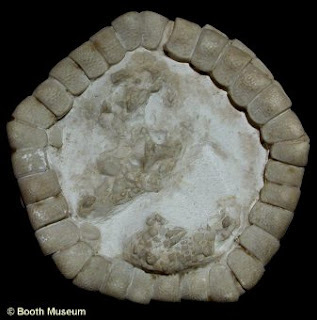 All of the authors are published scientists and the book reflects both their knowledge but also their access to some of the most gorgeous of crinoid fossils. Comments: A well-balanced book for both the scientist and the interested reader. There is science but also a powerful photo image aesthetic in the book that makes it appealing to anyone who loves fossils. Available at: Amazon.com. Hardcover is now out of print (although still available)..but paperback is available at 74.13.
pt. 2: The Cretaceous Cookie Ghost of Christmas Past! Today, let's look at some Cretaceous Cookie Starfish Madness! Before I get into things too deeply, I wanted to credit this AWESOME site, Discovering Cretaceous Echinoderms. Click here to see all of what's below and more! 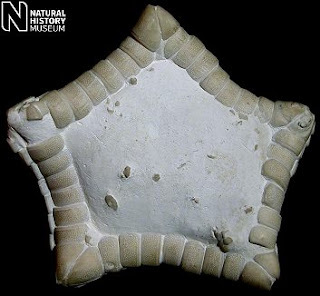 It turns out that goniasterids with this pentagonal body form have been around for quite a long time. 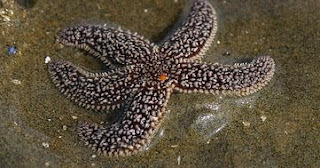 Most starfish have a really poor fossil record, mostly because the little tiny bits that make up their bodies fall apart not long after the tissue that holds them together rots and gets washed away. 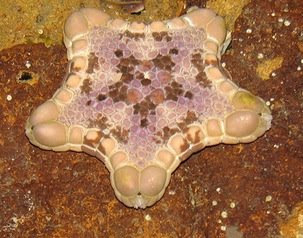 BUT, goniasterid starfish (and other similar taxa) have pretty heavy body skeletons and so, the chances of such a body being preserved increases, especially when there are good environmental opportunities for the animal to be buried quickly...such as in marine environments on a sedimentary bottom. In the Cretaceous (about 65-145 million years ago), the world is a familiar but different place. 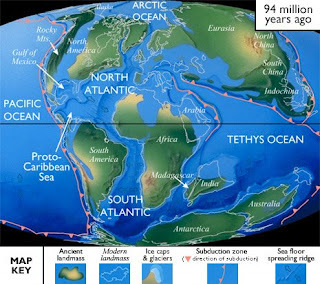 Many of the landmasses are there..but the oceans extend much farther beyond what we know today. There is a massive inland shallow water (i.e., epeiric) sea cutting through Texas and most of western North America. Effectively leaving what we know of the west coast today as an island. Note that most of northwestern Europe is underwater. This is partly what makes for an unusually well preserved starfish fauna in this part of the world! The Cretaceous of Europe..especially as studied by English, French, and German paleontologists has documented a huge diversity of fossil starfishes. This region is famous for its chalky marine deposits...and it is here that we find some of the most abundant spectacular fossil starfish in the world. 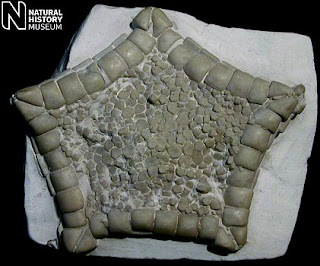 Perhaps one of the best known of these Cretaceous starfishes are those species in the genus Metopaster, whose name alludes to architectural structures known as metopes which are "rectangular architectural elements between two triglyphs..". 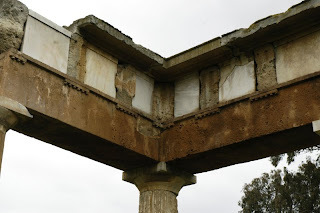 These were often ornamented or had elaborate sculptures. Don't be fooled by these amazing specimens though! I'd say 98% of the total number of Cretaceous starfish fossil are actually recovered as little pieces called ossicles. and can often be found in the hundreds of THOUSANDS. 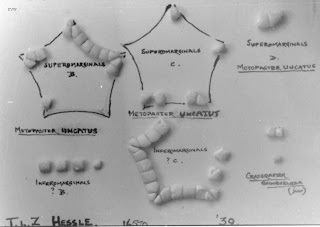 Much of the European foundation for Cretaceous asteroid systematics is based on the abundance, description and interpretation of these ossicles. Genera and species have been named solely on the ossicle bits alone. A lot of it is very tricky..and often involves reconstructing the ossicles, once you've got an idea of what the original body looks like. And often, they will just plain luck out like this specimen and find an actual preserved skeleton! This, is essentially like getting a key to a very hard exam! But it does give you some idea where all the parts go! Interestingly, a LOT has been done with starfish "ossicle systematics". My colleague Loic Villier & his associates for example, have been finding a lot of evidence for predation from these fossil bits. Christian Neumann has found evidence for shark/fish predation on ossicles. Other ossicle studies have provided insight into the evolution and macroevolution of Mesozoic goniasterids through time! Ironically, we may actually know MORE about the ecology and biology of Cretaceous goniasterids then that of the living ones!! pt. 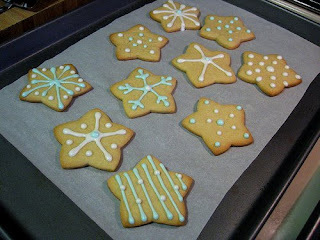 1-Cookie Starfish vs. Starfish Cookies! Happy Holidays! 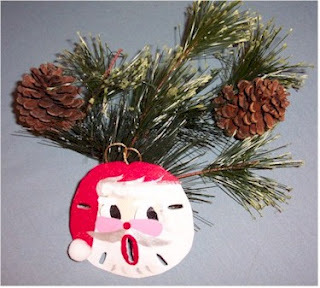 I thought I would take a holiday theme to this week's blogs! 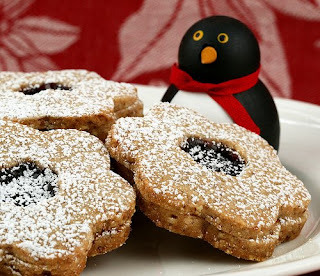 What is more full of holiday cheer then...Christmas Cookies! And what do I think of when I see Christmas Cookies? 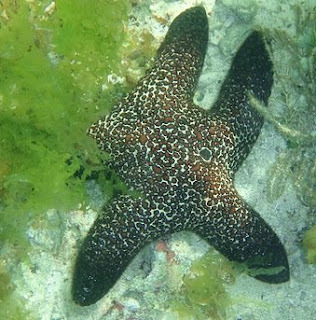 Goniasterids!! 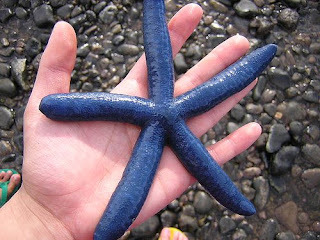 Specifically the Goniasteridae, a huge family of largely cold-water starfish. 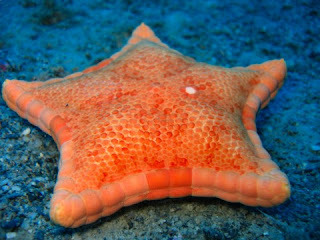 Probably one of the most diverse of ALL the starfish. They typically have heavily calcified bodies and have sharp-well defined bodies. 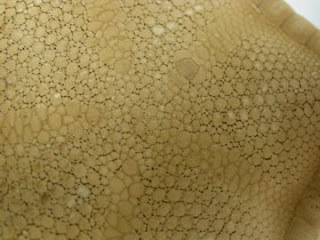 Some of these taxa which have a perfectly pentagonal shape...i.e...The "cookies"!!! 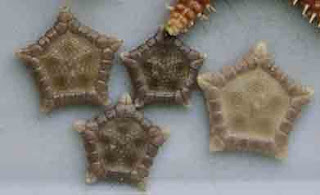 Almost all "cookie" goniasterids have some morphological similarities, plus some interesting (if similar) etymologies! 1. Tosia. As we've previously discussed, the name is latin for "inestimable". I recently reviewed this group and they are a really neato group of animals. "True" Tosia lives only in Australia, mostly in shallow-water. 2. Glyphodiscus. Another group, I worked on...The name means "glyph" (=carved or engraved) and "discus", an allusion to the shape resembling dinner plates (i.e., discoid) carved out of limestone! Glyphodiscus lives in the central & south Pacific in deep-water (continental shelf). Sadly, not much is known about them alive. But they are approximately coin-shaped (about 2-3 cm diamter) and are perfectly smooth. 3.Sphaeriodiscus. 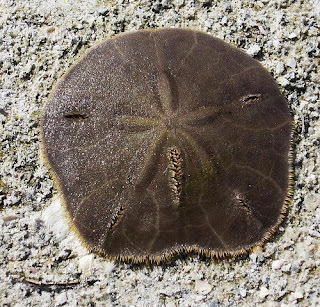 One of the the most taxonomically perplexing group of "cookie" goniasterid starfish. Helen Clark (formerly of the New Zealand Institute of Water & Atmosphere) described one South Pacific species...Sphaeriodiscus irritatus. Sphaeriodiscus refers to the "spherical" shape and "discus" to the discoid shape...And the species epithet "irritatus" is a direct reference to the irritating path of taxonomic determination! 4. Eknomiaster. 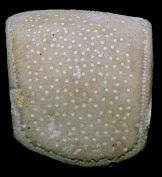 A weird, new goniasterid (Eknomiaster beccae figured here) from the South Pacific (New Zealand & New Caledonia). The name is derived from the Greek Eknomios which means marvellous or unusal..and it certainly is! On the surface...a starfish that almost looks like it was assembled out of a model kit from tiles.... But!! You turn it upside down and look at the "oral" side..and voila!! A surprise!! Wheee!! One big pedicellariae ( jaw-like structure) in each section! And others have even MORE! Found in the Atlantic, Indian and Pacific oceans, usually in subtidal (in the Mediterranean) to deep (Indo-Pacific). We often forget that there's a BIG difference between living animals and dead specimens. Is there significance to the "cookie" shape? Defense? Functional constraint? What's going on with the big puffiness??? One thing we do know? 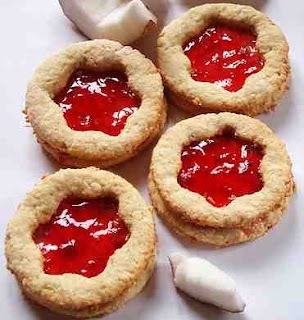 The "cookie" shape has been around for awhile! PART 2!! On Thursday....."Cookie" starfish in the PAST!!!! Today..some Video from some recent expeditions to Antarctica by The Census of Antarctic Marine Life! to see the full Youtube channel for the Census of Antarctic Marine Life click here. Video from the Deep Underwater Camera by Rob Beaman, research scientist in marine geology at James Cook University, Cairns, Australia. Feather stars live fixed to a substrate (sediment, other organisms) by small appendices called cirri. To move about, they free themselves by opening the cirri and moving their arms in an organized fashion that releases them. They rise in the water column and move a few meters then drop like a parachute. The video shows several Antarctic feather stars swimming, here: Promachocrinus kerguelensis. It can move as a flight reflex when confronted with a potential predator or an environmental disturbance, due here to the approaching camera. Swimming time is brief (a few seconds) because the energy required to mobilize the arm muscles is quite substantial. Third ROV footage of the seafloor in the Larsen B area, Antarctica. It was taken at 250 m water depth, right in front of the new ice shelf edge after it collapsed in 2002. The bottom is composed of very fine sediment and occasional drop stones, which is surprising, so close to the ice shelf edge. The first fifteen seconds show a recent ice scour left by an iceberg on the sea floor. Then, the first translucent species of holothurians (also known as sea-cucumbers) appears, which is feeding by extracting organic matter from the ingested muddy sediment. The second species, on the left side, is bigger, with a plumper shape, and is very rarely seen outside the deep sea in Antarctica. These two holothurians were the dominant species. The next animals are a solitary hydrozoan (related to corals), three yellow sea lilies, or stalked crinoids, also commonly found in the deep sea and finally a sea anemone. They are followed by two types of structure; firstly a crater-like, probably also created by a foraging animal, and secondly little mounds, possibly produced by burying worms. The sequence ends with two bushes of colonial hydrozoans and a glass sponge. And...More ROV footage..keep your eyes open for the Antarctic cucumber!